A Stunning ' Tilted Heart in a Heart' Cubic Zirconia and 925 Sterling Silver Pendant finished with rhodium polish. The pendant is 2.7cms long and 1.8cms wide. 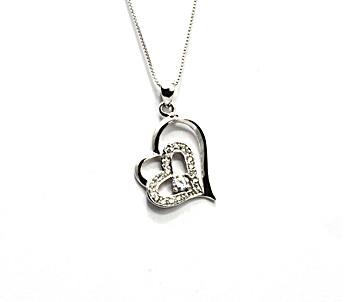 The pendant comes with an 18" 925 Sterling Silver Rhodium Plated Chain. If you require any other length of chain then please see our chain section for options or contact us for details.